I followed with a text asking how long it needed to cook, and received this response: “25-30 minutes@ 350”. The recipe was appealing in its simplicity, and if it really came from Great Grandma Mollie’s infamous church cookbook, I knew it had to be good. Let me give you some background on Grandma Mollie, her church and her cookbook. Grandma Mollie came to the U.S. as a German immigrant from Russia in 1911, when she was 2 years old. Her family (along with a few other German immigrant families) founded St. John’s Lutheran Church in Dowagiac, Michigan. Over the years, the Ladies’ Aid hosted several fundraisers, and their most popular was the sale of cookbooks. They sold many over the years, and the book this bread recipe came from was called Recipes to Warm your Heart, from the Heart of America (my mom had a hard time finding the title for me—the cover is gone from her book). I couldn’t find the book for sale anywhere online, but I did find a link on amazon.com, for volume 2. The book is for sale for $97! These are clearly some valuable recipes. I decided to make it that night to go with the soup I was cooking. Unfortunately, though the flavor was great, the bread was dense and not cooked through all the way; I had even let it cook for an extra 20 minutes. After a few more text messages back and forth with my mom, I learned that she had sent the recipe to me as soon as she read it in the book. It hadn’t been tested yet. She made it that same night too, however, and her batch turned out. She forgot to tell me to “beat well” and she, as an experienced bread maker, modified the cooking time to close to an hour. When baking, you have to be so precise (I don’t even want to tell you what happened to the cookies I tried to make over thanksgiving this past weekend; they were terrible, and mind you, they also came from a pre-mixed bag (of course I had to try to doctor it up! ), which is why I usually stick to cooking. Since then, I’ve made the bread a few times, and it really is wonderful! It’s so easy to make, and has a sweet, yeasty, doughy taste—a perfect complement to a bowl of winter soup. Below you’ll find my modified recipe. Grease and flour bread pan. Pre-heat oven to 350 degrees. Mix ingredients. Beat well (I’ve been using my electric hand blender). Pour into bread pan, bake at 350 for 55 minutes (or longer. Keep an eye on it. You want the top to turn a golden brown). If desired, serve with butter to spread. 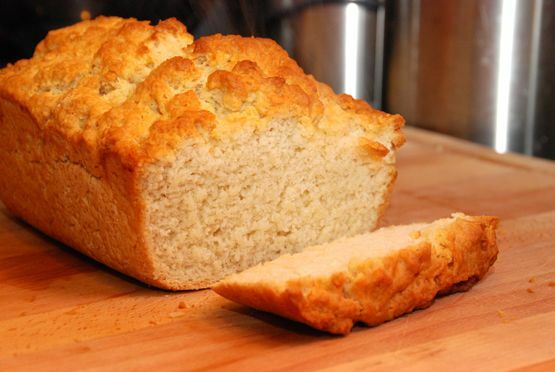 This entry was posted in 5 ingredients or less, Breads, cook books, Easy preparation, Uncategorized and tagged bake bread, beer bread, easy bread. Bookmark the permalink. Let me see if I understand: you tried to alter a recipe and it failed miserably? That’s it…you are allowed no more remarks on how I attempt to cook without butter! Just took my attempt out of the oven and it’s delicious. I think the extra baking time really helped, I couldn’t imagine just letting it go for 30 minutes. Thanks for this, it will be a good addition at the Christmas table. So glad you gave it a try and I’m glad to hear you enjoyed it! Thanks for reading, and I hope you had a merry Christmas!